Truro City manager Leigh Robinson hailed top scorer Tyler Harvey after his 21st goal of the season rescued a point for his side at Bath City. 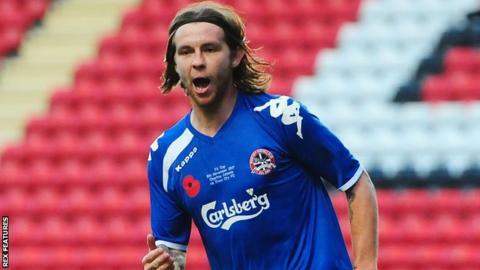 His 19 league goals are more than a third of Truro's total in National League South this season. "He's having a great season," Robinson told BBC Radio Cornwall following the 1-1 draw. "It shouldn't be as a good a season as he's having as his diet's an absolute disgrace, but he's a hell of a talent." The former Plymouth Argyle youngster, who also had a trial at Exeter City and spent time at Wrexham two seasons ago, is the joint second-highest scorer in National League South behind Torquay's Jamie Reid. "In a game where he was relatively quiet he pops up with a goal at a key time, so he's really important for us," Robinson added. "The key thing for us now is to try and get a few more people contributing around him in terms of goals. "But it's always a good thing for the team, even today away to a good side like Bath, desperately huffing and puffing in the second half to try and get back into the game, it's good for the belief of this team that we've got a player like Tyler on the pitch who can get us a goal out of nowhere."